Preheat oven to 200c fan-forced (220c non-fan). Line two baking trays with baking paper. Unroll the pastry sheet, lightly dust the top with flour, remove the plastic sheet and dust the underside with flour. Cut the sheet in half to give you 2 squares. Place on 2 baking trays and pop in the fridge. Smash the garlic clove with sea salt, add the ground cumin followed by 50ml olive oil, mix to combine. In a large mixing bowl toss the pumpkin with the olive oil mixture, season with a little extra salt. In another mixing bowl combine 1 tablespoon olive oil, balsamic vinegar, a little salt and the thyme, add the red onion and toss to combine. 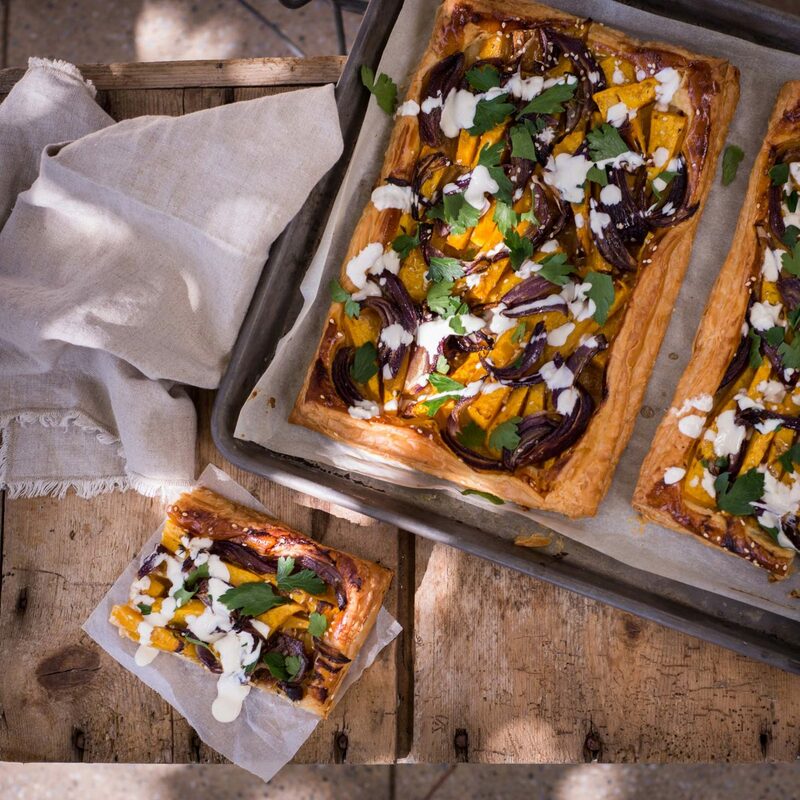 Divide the pumpkin and red onion between the two tarts leaving a 2cm border, brush the border with beaten egg. Bake in pre-heated oven for 15 minutes, reduce oven to 180c fan-forced (200c non-fan) and continue to bake for a further 15 to 20 minutes or until pastry golden brown. While the tarts are baking prepare the tahini dressing. Smash the garlic clove with sea salt (or finely slice), combine with the tahini, yoghurt and lemon zest, mix until combined, it will be quite thick, loosen with a little water adding a dessert spoon at a time, taste for seasoning. To finish dress the tart with the tahini dressing and the coriander or parsley.